Bottom, left to right: Dominique Bautista, Leonora Anbgeles and Carolyn Nakagawa. Top-left to right: Henry Yu, Alejandro Yoshizawa, Chris Lee, Glenn Deer and Anne Murphy at UBC in Vancouver. Twelve hundred white paper boats hang from the ceiling at UBC, representing a myriad of migration stories. There are just three other graduates from the program’s inaugural year, including Nicole So, who was born in Hong Kong and raised in Vancouver. Her studies included making an animated video titled 4 Reasons Why You Should Care About Vancouver’s Chinatown (https://www.youtube.com/watch?v=yMVRQo3KSOk), and directing a documentary titled Rich Asian Girl, which explored contemporary stereotypes. It used to be that in order to achieve university-level credit for this kind of work, students had to go to the U.S. and, in particular, California, which pioneered the concept of Asian-American studies. Indeed, on a recent evening, a group of Vancouver academics, business owners, filmmakers, volunteers, politicians, retired surgeons, tailors and architects, to name a few, filled the dining room at UBC’s St. John’s College to celebrate the new graduates. 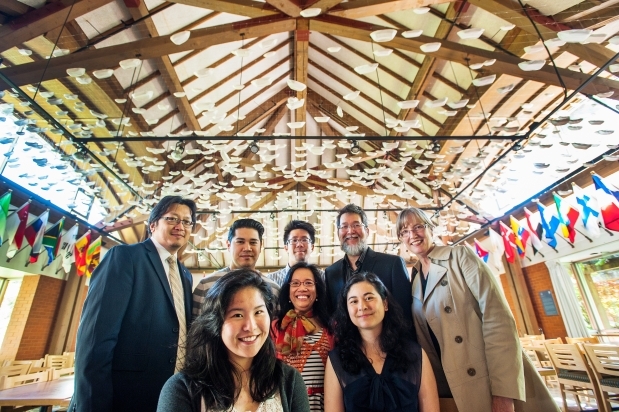 Dominique Bautista (right) and Carolyn Nakagawa with more than a thousand white paper boats hanging from the ceiling at UBC, in an installation designed by artist Gu Xiong, representing a myriad of migration stories. Many have shared their varied family stories of arriving in B.C. from Asia, and sometimes even going back and forth over different generations. It is an evocative location for talking about all of this because the residential college was started at UBC by alumni of St. John’s University in Shanghai, one of China’s oldest and most prestigious universities, which was closed by the communists in 1952. Adding to the effect is an art installation of more than a thousand hand-folded, white paper boats hanging from the ceiling with string in a floating mass from one high window across the room to another. They represent a myriad of migration stories, said Yu. Some are small boats, others larger. A few are dented or look like they got crushed and were deliberately not tossed out, he added. “It’s not just academic Asian studies, literature and such, but documenting, provoking and gathering stories and (fostering) discussion. It will bode well,” said Jim Wong-Chu. He is the Vancouver author, poet, editor and historian who has long been the keeper of such tales in the Chinese-Canadian community going back to the 1970s, and was recently selected to write a “celebration book” about prominent Chinese-Canadian figures in B.C. history as part of the provincial government’s broader effort to make amends for its legislature’s role in discriminating against Chinese-Canadians.